After a two week wait whilst backpackinglight waited for the next shipment, I finally have my hands on a Bush Cooker stove. As usual an excellent service from Rose who kept me informed of when they were expected to arrive. When I opened the package there was a hand written note and a packet of jelly babies along side the kit I had ordered. Yesterday I had a call on my answering machine to check all was in order. Nice personal touch. I hate using stoves that run off gas canisters but may well post a rant on that another time! The Bush Cooker appeared to offer a solution. As I has always fancied a titanium pan I also ordered the Tibetan titanium 1100 pot. The Bush cooker fits into this perfectly as this picture shows. I could review the pan but don’t have much more to say than it is a pan and it is made from titanium! The Bush Cooker appears to be well made with neat edges. The pan support nestles upside down within the stove to protect it. I find this quite difficult to remove as it is a very snug fit and its edges get caught inside the pan. It is also difficult to get back in without bending it. I had collected a bag of twigs no thicker than my finger from the garden at work during the day. When asked what I was doing I just said that twigs were my hobby. I was left alone………….. Anyway back at home I lit a piece of Hammaro tinder card which was about an inch square and placed it on the grate at the bottom of the cooker. I then placed small twigs on top that quickly ignited, adding to the fire slowly. It was soon burning brightly. Once the stove had got hot I noticed flames coming out of the holes at the top of the inner skin. This looked like wood gasification taking place where the gas released from burning wood is reingnited. Think of the flames that come out of the side of the trangia burner but in this instance going inwards into the stove. Popped on a pint of water which took 12 minutes to come to a rolling boil. All the time I was adding small pieces of tinder to keep the fire burning brightly. Once the flames had died down it took a while for the stove to cool completely as there were glowing embers on the grate. This could be usefull for that final slow simmer. After a quick clean I took the stove indoors and tried it with a pop can side burning stove. This was disasterous and I nearly set myself on fire as the meths got to a super heated state inside the Bush Cooker. I then tried a trangia burner on top of the simmer ring inside the stove. This worked very well indoors so will try this out in the field. All going well I will have a woodburning stove with the option of a meths burner that is well supported and protected from the wind. I then got all Blue Peter and made a pot cozy. Anyway a garden test is all well and good, I will do an update when used on a backpacking trip……………………………. Last weekend I finally got out for my first backpacking trip of the year. I have had a route planned in the Yorkshire Dales for over a year now but have never got around to actually walking it. As the Dales are less than a 3 hours drive away and I did not fancy a long journey, I decided to finally walk it. Having a campervan meant that we could travel up on the Friday evening and sleep in the van before setting off on the Saturday morning. Myself and Rae set off after the rush hour traffic had died down on Friday evening for the drive up the A1. Traffic was good and we were soon heading across the moors between Leyburn and Swaledale looking for a place to park up for the night. A spot was found next to the road, a brew made then a good nights sleep was had. The next day dawned warm and sunny so breakfast was made outside the van and rucksacks packed for 2 days out on the hills. We then drove and parked up in the car park by the river in Marske. A path heads north along the eastern side of Marske beck through lovely woodland. I was cursing the fact that my Bush cooker stove had not yet arrived as there was loads and loads of dry twigs everywhere just begging to be picked up! We soon arrived at Orgate force. On a hot day it would be nice to swim at the base of the falls, a chill wind was blowing so we continued north up the valley before heading west up Marske beck towards Helwith. The dale was deserted even though the scenery was as good as any you get in the Dales. The valley now headed north and its name changed to Holgate beck. The moors were slowly encroaching onto the valley and the scene was becoming wilder with every step. Lunch was had behind a wall where out of the wind it felt like a warm spring day, however in the wind we were quickly reminded of winters bite. Just after lunch whilst walking across a field a pig launched itself downhill towards us, making Piggy noises. Its friend soon joined it and we spend ten minutes in fits of laughter as they ran about us squealing, trying to get food out of our pockets and biting our boots! North of Kexwith farm the valley splits at Arndale hole, the arm heading west becomes Arndale beck. The river was flowing well for a couple of hundred metres to a point where a large spring was flowing into the river bed. For the next few hundred metres the river bed was dry and we were able to scramble through dried up waterfalls through the narrow gorge like valley. Leaving the valley it was a fairly dull slog up the slopes of Arndale hill where there was an area of old mine workings amongst the moorland grasses. Crossing the summit of the Stang road we only had Hoove to climb before pitching camp for the night. The rough ground and having a large pack on our backs for the first time in months made the going pretty tough. Hoove was also not the most inspiring of summits, the the actual top being somewhere south of the trig point. Being a bit of a collector of hills we wondered about for a bit trying to establish the highest spot. Weirdly whatever point we stood on there always seemed to be somewhere that looked higher! We dropped down and pitched our tents on a flat grassy area below Faggergill scar just before it got dark. I have always struggled to get a good pitch with my Laser Competition tent but that night for some reason I managed to pitch it perfectly and it was as steady as a rock. Maybe it was the new pegs I had treated myself to? The night was still and cold and I remember waking in the night with the inner of the tent covered in condensation. A strong wind picked up at dawn so I ended up laying there for a couple of hours with a fine rain of condensation falling on me. I managed to hook the ends of the tent to the end pole for some air to blow through, everything soon dried out in the wind. Breakfast and packing tents was a battle with the wind which was getting stronger. We half walked and half staggered along the track towards High Faggergill farm before crossing the moor towards Shaw farm. The rest of the day was spent walking the moors above Arkengarthdale back towards Marske. The wind did its best at trying to stop us enjoying the day as it constantly tried to tear rucksacks from our backs and blow us off course. Luckily we found an unlocked shooting hut for lunch where we could get a brew on and eat in comfort. Finally we were above Marske beck where we were greeted with this great view. Of course by the time were were back at the van the wind had dropped………….. 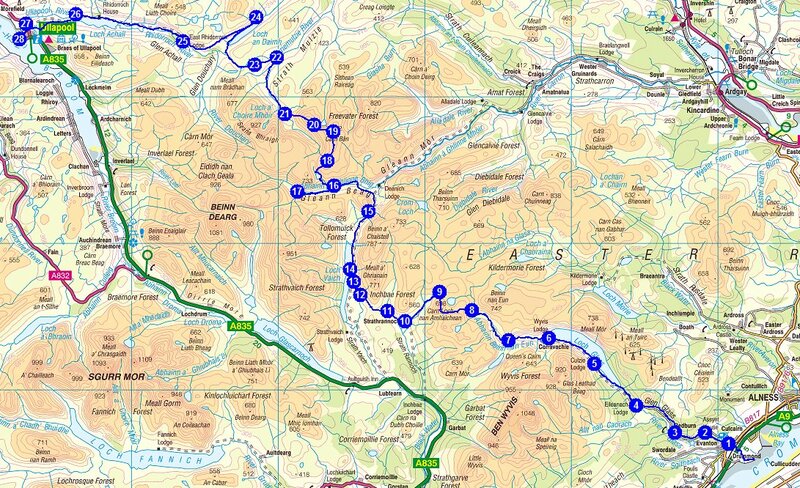 This time in 5 weeks and I will be embarking on a coast to coast backpacking trip across the Northern Highlands. This trip has been in the pipeline for months now and I have finally settled on my route. I wanted to backpack through the wildest scenery that the highlands have to offer yet cross from coast to coast within a week. This limited my route to the area north of Inverness where Scotland narrows dramatically and sea lochs cut inland. I also had to bear in mind that I will be backpacking in mid April and the weather may not be kind to me! There is a high chance that the high tops will still be plastered in snow and I want to travel as light as possible. This means taking a lightweight tent, wearing lightweight mid cut boots and not taking an ice axe or crampons with me. This meant planning a route that sticks to the lower glens with the option of climbing higher if conditions allow. I have decided to start at the village of Evanton on the Cromarty Firth and finish at Ullapool on the west coast. I will start by following Glen Glass to Loch Glass via the Black Rock Gorge. A track alongside Loch Glass will lead to the Abhainn Beinn nan Eun where I plan to wild camp. The following day will involve crossing rough moorland to get to Loch Vaich where I hope to wild camp by the old cottages of Lubachlaggan. I will then aim for Glenbeg bothy where I have always fancied spending a night, the area being really remote. The next part is the crux of the trip where I will cross the remote Corbett of Carn Ban. I am hoping that the conditions will be right to visit the summit of Seana Bhraigh before dropping down to Coiremor bothy. An easy day next to Knockdamph bothy before heading to Ullapool via Rhidorroch lodge. A total of 60 miles split over 6 days. 2 nights wild camping and 3 nights spent in bothies. I could do bigger mileages each day and knock a couple of days off of the crossing but am savouring just being in the wilds for that amount of time. The only drawback is the amount of food that I will have to carry – I will have to start dehydrating my own soon! Lets hope for a mild and sunny April in the Highlands! I have been really good for months now and not splashed out on any new kit. However in the last week I have ordered several items from the internet in anticipation of up and coming backpacking trips. Last weekend I decided to order the Bush cooker from backpackinglight. I have always hankered after the Bushbuddy ultra but the price has put me off, along with any potential hassles of extra charges from customs. I have been using a Clickstand stove for a few years now which is excellent, but last year disaster struck on a backpacking trip when I spilt half of my meths. If only I had a stove that could burn wood and could still be used with a Trangia burner. This is why I like the idea of the Bush cooker. Bob at backpackinglight had sold out of the Bush cooker when I placed my order but stock was due in within a couple of days. Yesterday I got an email to apologise for the fact that the stoves had been held up at customs, so a few more days of waiting. At the same time I ordered a Tibetan 1100 Titanium pot which the Bush cooker is meant to fit into well. Whilst there I also added some tinder card, tick tweezers and a backpacking pillow. My rucksack always seems to be filled with various plastic bags so decided to order a pack of 4 Exped dry bags. The weights on the website seem pretty low and they should give me confidence in wet weather that my kit will stay dry. Finally I treated my Laser competition tent to some Vargo titanium pegs as the ones it was supplied with are frankly rubbish. Who knows I may even get it together to write some gear reviews! ?